Today's quiet book comes from Amanda at My Cup Overflows. Her book is really well made and contains some particularly cool pages - I love "The Armor of God" page and the "I Spy" pages especially. 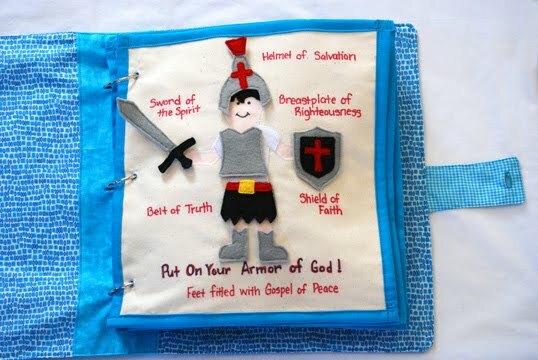 I'm totally planning on including "The Armor of God" page in my bible quiet book, whenever I eventually make that in the future. Amanda Johnson. I am a stay-at-home wife, mother of three, and my heart's desire is to follow God wherever He leads me. I made this for my son, Zechariah, who is four. I wouldn't say I was professional at sewing, but I know my way around well enough. My mom started teaching me when I was a young girl as part of my home school curriculum. I've had years of playing around with a sewing machine. Way too many hours! I spent the afternoons, during my sons nap time, every day for weeks. Each page would take me at least 3 hours, some of the more complex pages were much much longer. I worked on it for 2 months. 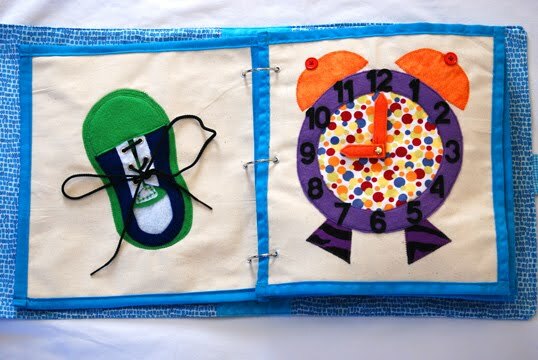 My inspiration came from "How to Make a Quiet Book." There are so many great ideas and pages there! 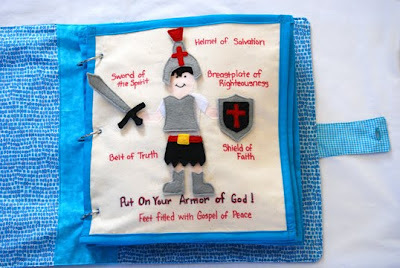 I used this Laura Thoughts - Put on the Armour of God Template for the Armor of God page. 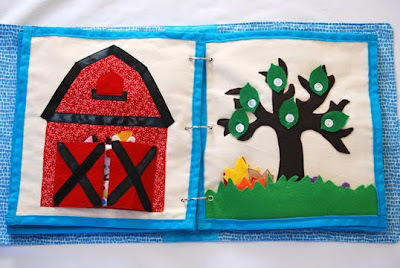 I love the mail box and letters on this page: Leafy Treetop Spot - Quiet Book Love Letters. My season page idea came from here Serving Pink Lemonade - Quiet Book. I don't remember where my barn page came from. I did use a template for it. I know there are a lot of them out there. I bought a pair of eyelet pliers to use for the binding. I had never used them before, but they made it so simple. They were definitely worth the money I spent on them. The cover I made came from this blog: Tidbits - How to Make a Quiet Book Cover. I did not use the traditional muslin. I found it to be too flimsy for my taste. I believe what I ended up with is a heavy utility fabric. Lots of felt! Scrap material, a few yards of fusible interfacing, tons of snaps, ribbon, eyelets, beads, some Velcro, and buttons! I'm sure there's more that I'm forgetting. I think my total was between $50 or $60. I did buy some pliers with that, and I have lots of things left over. I probably could have made another quiet book with my leftover supplies. My favorite page has got to be the I-Spy page. 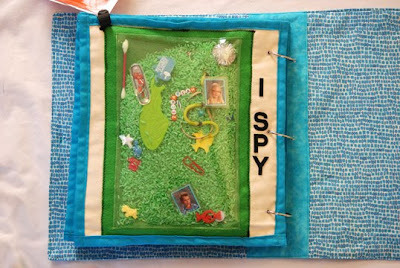 I had so much fun gathering items from around the house to include in the I-Spy pocket. I thought some of my items were too big, and it would be too easy, but they still have room to hide. 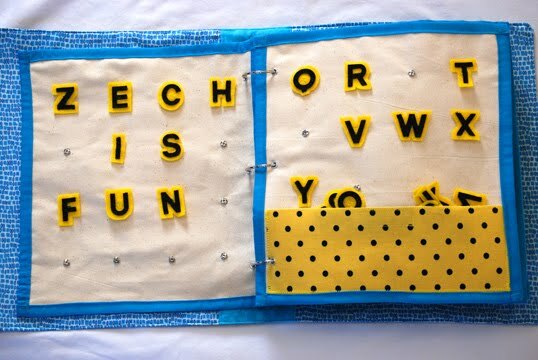 Even my older kids will play with this page; it's everyone's favorite. 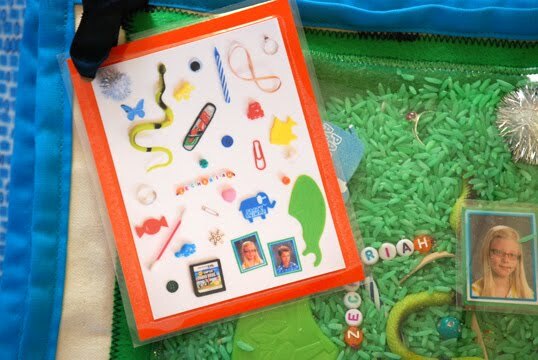 To read Amanda's original post about her quiet book on her blog, with more pictures and more detailed explanations, click here! Thank you, Amanda, for sharing your wonderful quiet book with us! Have you made a quiet book that you'd like to share? Click here to learn how to submit your own quiet book! Today's post is from Ashley at aJ Perspective, and it's pretty unique: it's a single page! 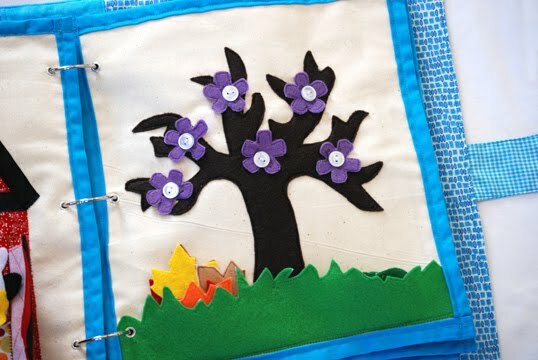 Ashley made a beautiful and amazingly detailed flower page for her daughter back in 2010, with plans to do more. I really love the embroidery on this page; each flower is so unique and darling. You'll be excited to know that Ashley has now started making one quiet book page a week, and is giving out free quiet book templates for her pages! Download this flower page template here. You can check out her newest page (a really cute and unique barn page) here. 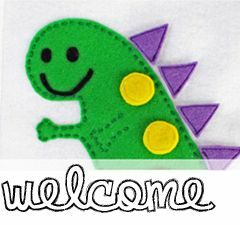 Definitely continue to check back on her blog in the future, as she'll continue to post new templates that you can use! My name is Ashley Jackson. I am a mother, wife, organizer of all things, creator, and Christ-follower. Who did you make this quiet book page for? How old are they? I made this page for my daughter who was, at the time, about 1 year old. 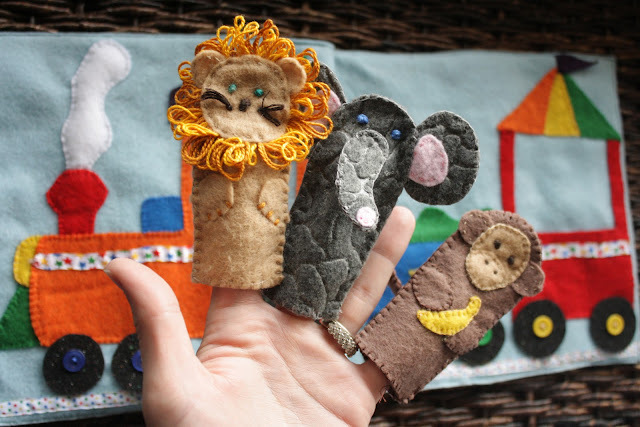 I have been sewing since my mother taught me as a small child. 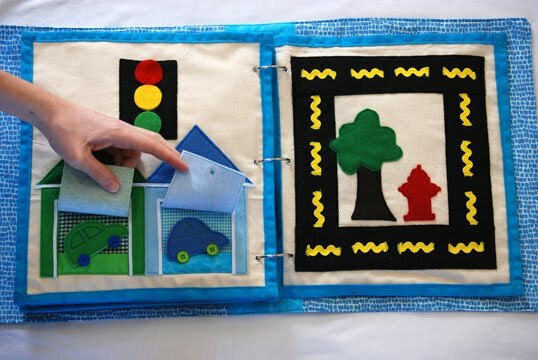 I remember learning to do simple embroidery at Vacation Bible Schools and sewing doll pillows and blankets from my mother's scrap stash once I got a little older. 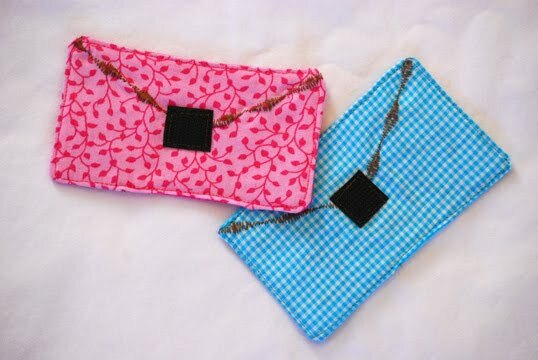 I love all kinds of sewing - quilting (i've made several for my daughter), hand embroidery, and crochet. I made my flower page during a trip to visit my mom. As usual, our days were packed so I mostly spent evenings working on the page. All told I spent about 5-6 hours spread out over 2-3 days. I didn't have any templates and this was the first bit of embroidery I had done in years. I more or less winged it, cutting out varying shapes for flowers, learning how to make the button holes for attaching to the stems, and free form decorating each flower. What material is the page made out of? The page itself is made out of, what my mother always called, unbleached domestic. It's a heavier fabric that I thought would help the page hold its shape. With that as the base, I added the felt to it. Oh, and I used green ric-rac for the flower stems. All in all, I probably spent about $5 on supplies because I had most of it on hand. To see Ashley's flower page (with more details and explanation) on her blog, click here. To download her flower page quiet book template, click here. To see her new barn page and get the free template, click here. Thank you, Ashley, for sharing your awesome flower page with us and for the free quiet book templates! 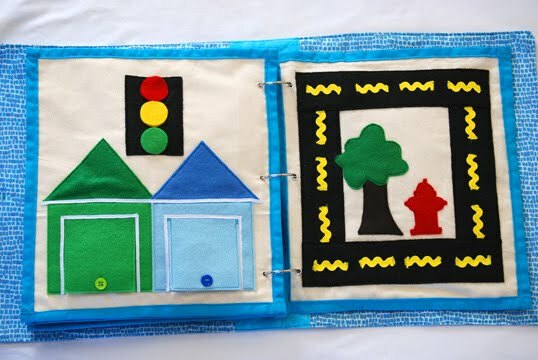 Today's quiet book is from Trina at Baby Jayne's, and it's really different from anything we've shown you so far! 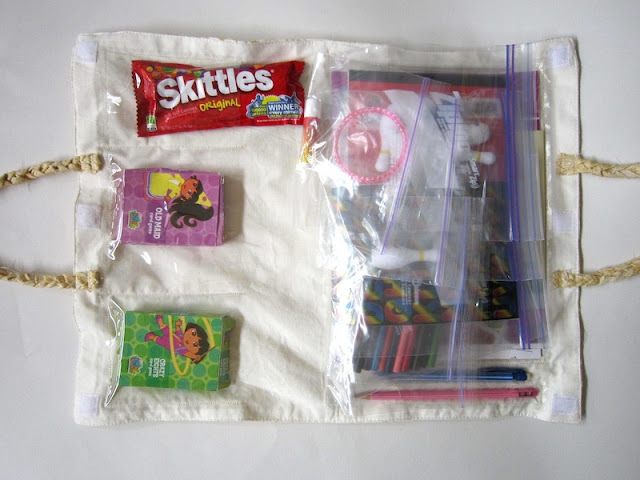 Trina made a "Changeable Activity Tote," which is a really interesting and cool take on a quiet book. 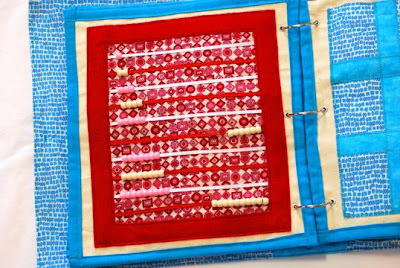 Using placemats, ziploc bags, and hand-braided handles, she created the awesome creations you see before you (and which you can create following her tutorial here). My name is Trina. 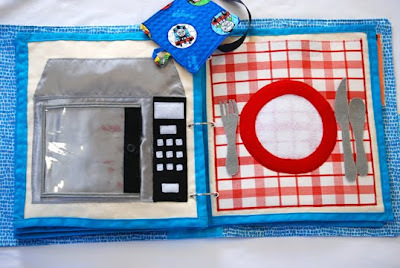 I love to cook, sew, and craft in an effort to make a handmade and fun life for my 3 kids and husband. I made 2 quiet books. 1 for my 4 year old boy and 1 for my 7 year old daughter. I am an advanced sewer but this took a very basic level of sewing- just a few straight lines. It took about 2 hours, start to finish, once the supplies were purchased. No. I used a place mat I bought at Target for the main body of the book. There really isn't any binding in this book. By using a place mat, this gave the book a nice firm outside. I then used plastic and plastic bags sewed into the place mat to create pockets and holders for all of the fun games and supplies for my quiet books. What kinds of materials did you use? 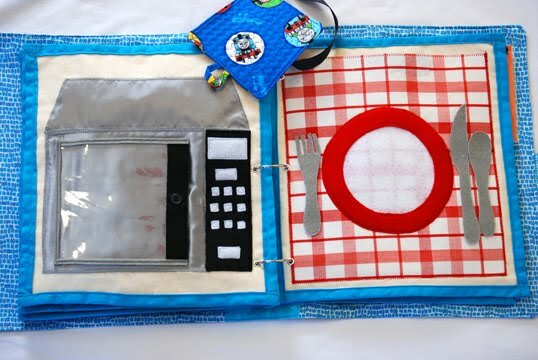 You need a place mat, a large sheet of plastic (you can buy this at Walmart or craft stores), some heavy duty zip lock sandwich bags, a little bit of fabric or ribbon to create handles and some thread in your sewing machine. 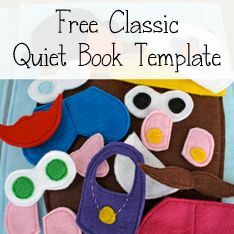 It cost about $5 to make the actual quiet book, but then I probably spent $10 buying all the games, puzzles, crayons, candy, etc. to go in the quiet book. There aren't any pages in this quiet book. 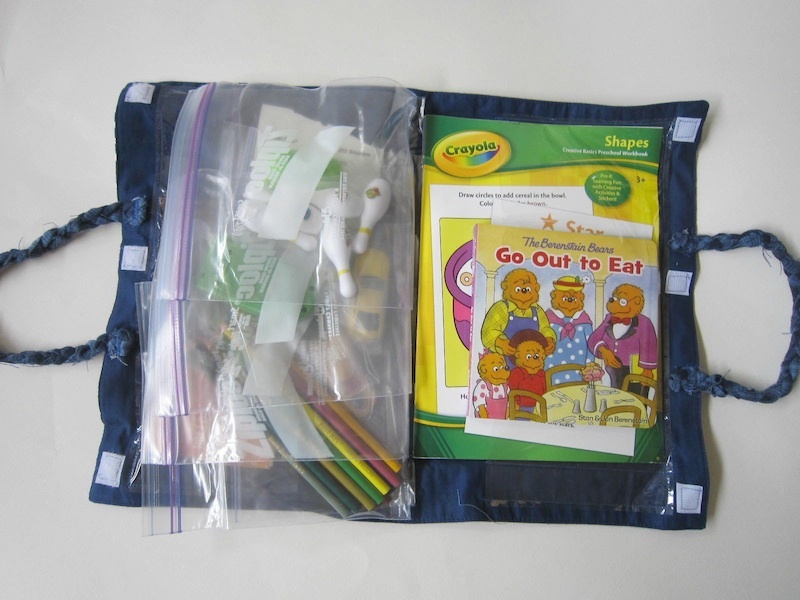 It simply has lots of different pockets and pouches to hold various activities. I like this because it can constantly change. The children don't get bored from doing the same activities over and over. I change the coloring books, games, cards, crayons, candy, etc. out constantly so it's always fun. If you have anything else you'd like to add, please do! I know this is a non-traditional "quiet book," but I think it's very effective and another great resource to have for your children. I love and have made traditional quiet books and they are true treasures. I think this interchangeable quiet book is another great thing to keep your children entertained and engaged when needed. I hope you have fun making yours! 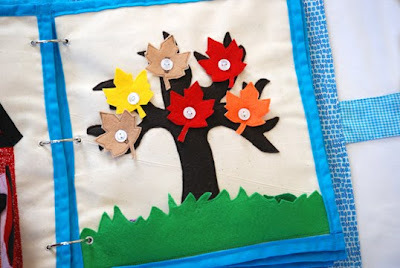 Here's the link to Trina's tutorial: Changeable Activity/Quiet Book Tutorial. Thank you, Trina, for sharing your really neat quiet book with us! Have you got a quiet book that you'd like to share? 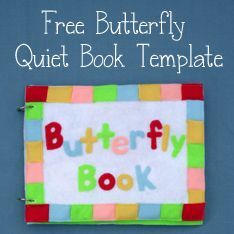 Click here for instructions on how to submit your own quiet book! Today's quiet book is from Cortney from Crafting With Heart. It's the first ABC quiet book we've had on the Quiet Book Blog, and it's adorable! I love all the hand-stitching, and I love that she includes actual pictures within the quiet book. Hi! I'm Cortney with Crafting With Heart. I'm a full time student, full time employee, full time wife, and full time crafter and I love every second of it! 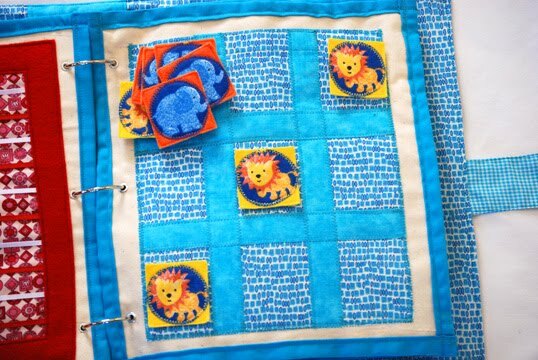 This quiet book was made for my baby cousin. She turned 1 in March of 2012 and I wanted to make her something special, which always means homemade. 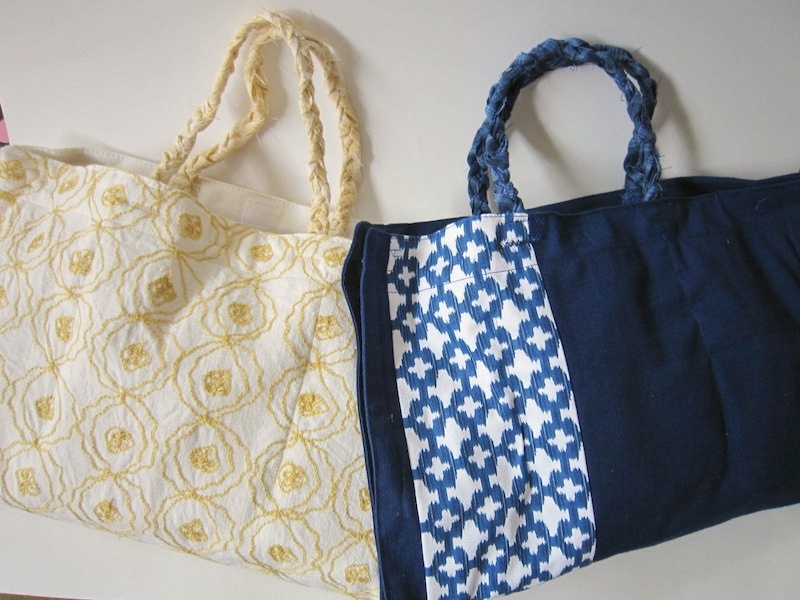 I actually got my sewing machine for Christmas of 2011, so I had only been sewing for a couple of months, although I had been practicing hand stitching for about a year. I didn't use any templates, I just free handed everything. I like this better because then everything is more original. I used felt for most of the project. 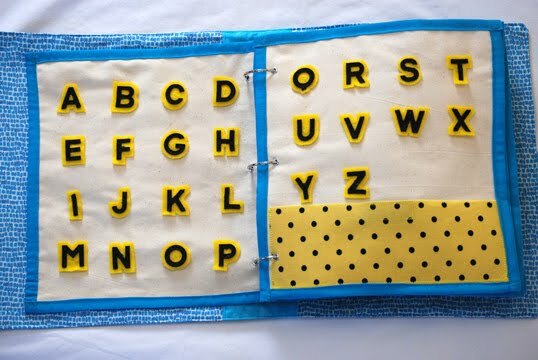 The pages are all felt and so are all the letters. 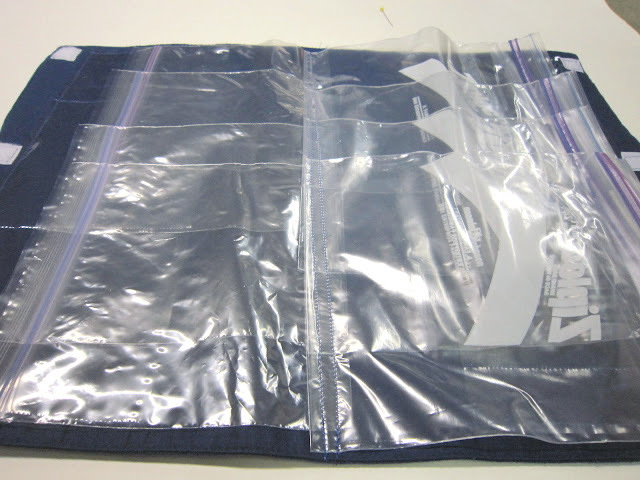 I did use plastic page protectors for a few of the items in order to protect the pictures I used. I also used a zipper and a few other small details to add some fun. I used mostly scraps for the colored felt, but I had to buy the white felt for the pages. I would estimate the cost between $12-$15 for the whole book. It took more time than money. I bound my quiet book by stitching the pages together first, then doing 3 eyelets down the side. I used 3 rings to hold the book together. My favorite page is definitely the O and P page. The octopus and pig just turned out so cute! I also love the last page though, because that is baby's favorite page. Quiet books are so much fun to make, and they make the most fabulous gifts! Come check out craftingwithheart.blogspot.com to see more exciting crafts! 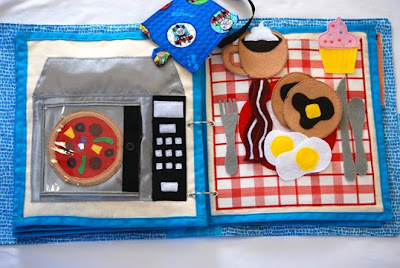 Click here to see Cortney's quiet book on her blog, with more explanations and details. Thank you, Cortney, for sharing your quiet book with us! Today's quiet book comes from my friend Lanette and her husband Shaun, who you can find at Shaun, Lanette, and Iris. They made it together and it is so cute! I love all the pages, and I think my favorite is the car page (I love all the little trees). I also love the dresser for storing all of Mr. Potato Head's accessories, and I definitely want to make a bead page like theirs in my next book. Be sure to check out Shaun and Lanette's adoption page here, too! My name is Lanette, and I love art, baking and reading, but most of all I love my handsome husband and our sassy, smart and adorable little girl! My daughter. She is about 18 months old. Personally, I have a very low level of sewing expertise, but my husband Shaun is really pretty good at it, probably "intermediate" level at least. This was our Christmas Break project. We spent approximately 6 or 7 hours on it as a team. It took about a week. Sheets of felt, which we purchased at WalMart for about 50 cents a sheet, and in multi-packs for about 3 dollars for 12 sheets. In addition to mass amounts of felt sheets in every color we could find, good sharp scissors and a sewing machine, we used lots of buttons for embellishments, woven thread for the doll's hair, google-y eyes for the finger puppets, hot glue and sharpie paint pen also for the finger puppets, wooden beads and ribbon for the shapes page, more ribbon and modgepodge for the spider web (we just oozed paint all over to get the page to be a bit more stiff and textured so the felt spider would "stick" a bit better, but take note, he doesn't actually stick that well!) 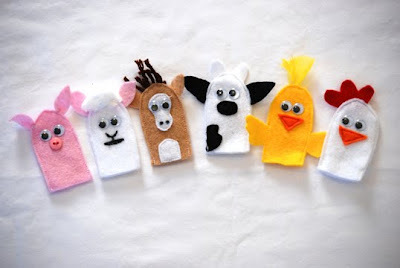 and velcro for the snowman page. In addition we reused an old zipper for the Mr. Potato Head's Dresser page, and used Dritz Jean Rivets to make holes in the sides to bind it. My mom has the little clamper tool that clamps those in. We spent about $30 total on this project, although we had a few of the supplies beforehand (buttons, velcro, modgepodge, hot glue, google-y eyes, ribbon, and wooden beads). Dritz Jean Rivets, which we clamped in using some fancy little tool my mom has. It cost about $10 for the clamper thing. We intended to use binder rings to hold it together, but opted for yarn temporarily. I love the doll page with hair that you can braid or play with. Shaun's favorite page is the car page, while our little girl really likes the Mr. Potato Head page and the Snowman page lately. Thank you so much, Shaun and Lanette, for sharing your quiet book with us! 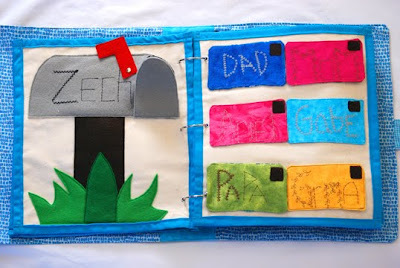 Today's quiet book was made by Britt from Britt & Her Boys, and it really is a fantastic one. She made it by following the templates from Imagine Our Life. I love all of the detail she put into this book - each page is seriously just incredible. She actually sewed the whole thing by hand (apart from the binding). And all of the pages look so fun! My name is Britt and I'm a stay at home mamma of two boys with a passion to make homemade items that will be cherished and last a long time! 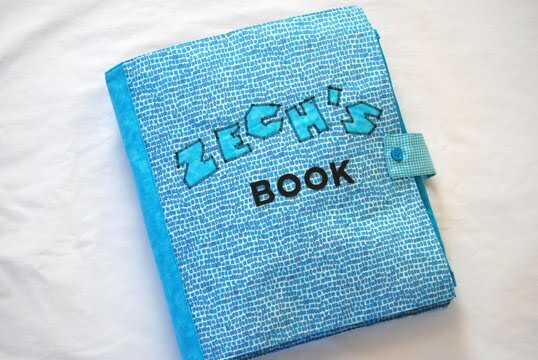 Who did you make this quiet book for? What are their ages? 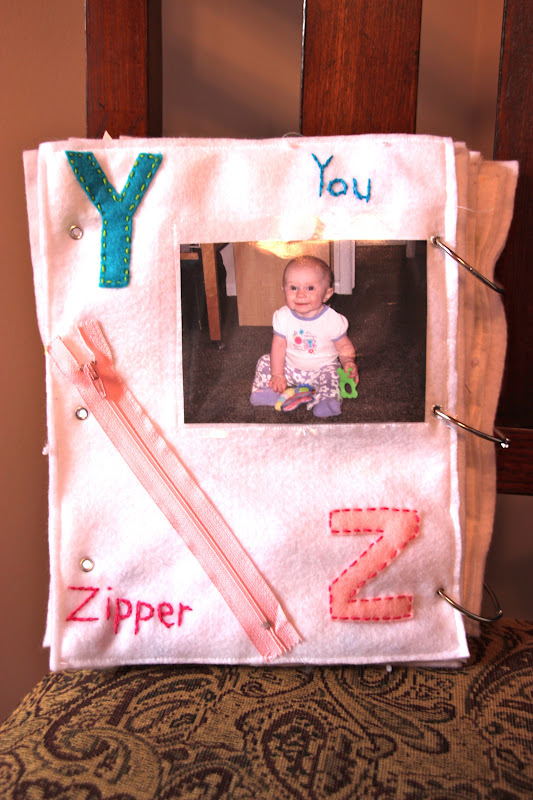 I started making this book for my youngest son, age one. But my 4 year old LOVED the pages so I made a few of them a little more "advanced" with smaller pieces. What is your level of sewing experience? I'm not sure what I would consider my sewing level. 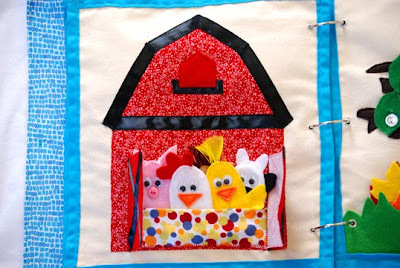 I do tons of projects for my boys from quilts to clothes and lots of projects around our house. 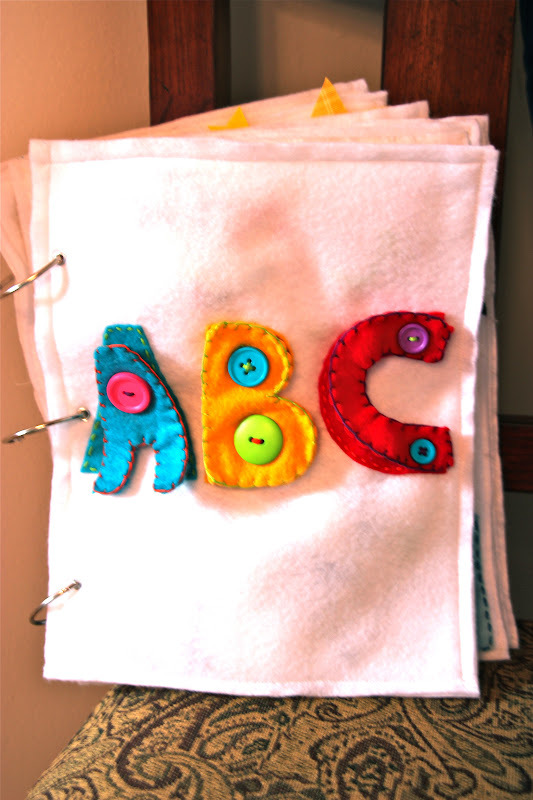 This book was done by hand and only a few stitches were used, so it would be very simple for a beginner. This book took a while, I will say that. But being a mom of two boys I don't sit down for long periods of time to work on projects. Overall, I would guess each page took about two weeks with a few minutes here and there. I did use templates for these pages and modified some a bit. I found them over at Imagine Our Life! How did you bind your book? What are the pages made out of? The pages are all (for the most part) made with wool felt sheets. The majority are 100% wool felt and the rest are made with a wool blend. Other materials used: plastic vinyl, silver polyester, a crinkly material, snaps, various buttons, beads, ribbons & sequins. One page I used a flexible mirror that can be cut to size with regular scissors. Wool felt can be expensive but I thought the quality was worth it for the time I was putting into the project. A lot of the other materials I already had, and a few specific things were purchased such as the mirror, snaps, and grommets which can all be found at any craft store. I picked mine up at either Hobby Lobby or Joanns fabric. What is your favorite page and why? 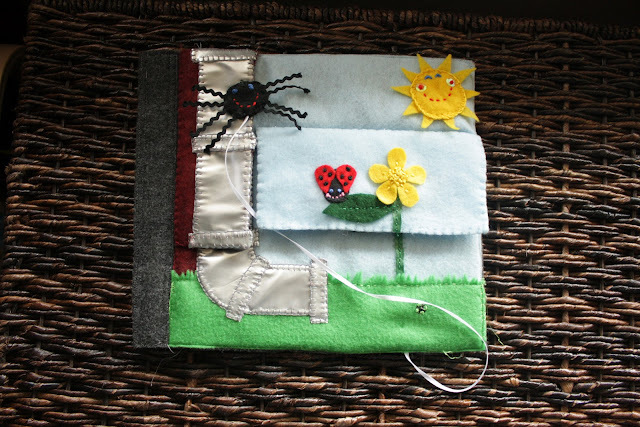 Britt's quiet book (with more explanations and pictures) can be seen on her blog here. Thank you, Britt, for sharing your quiet book with us!